The Heritage Film Festival @ Artomatic 2009 in Washington, D.C.! Wednesday, July 1, 2009, 6 - 8 pm, Thursday, 18 June 2009, 6 - 8pm, and Saturday, June 13, 2009, from 7 - 9pm. Additional screenings TBA. 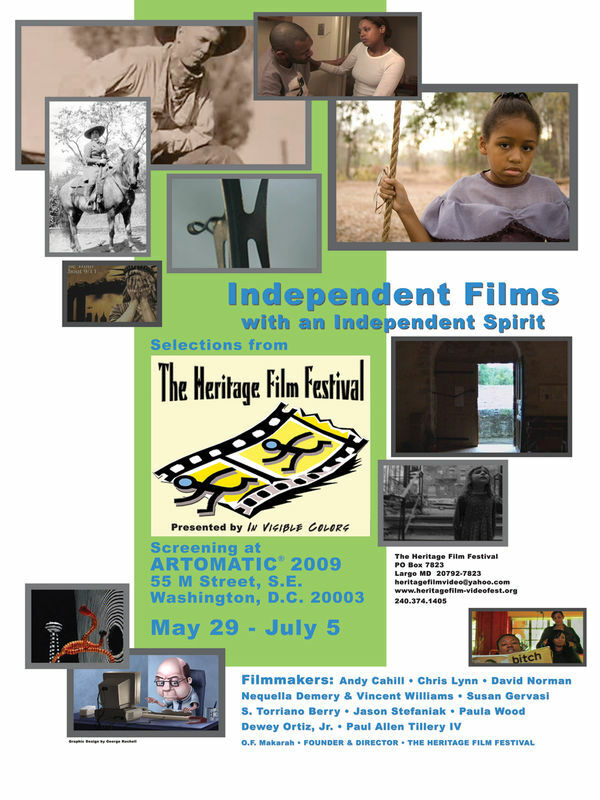 Our screenings (and all the Artomatic exhibitions) are free. Artomatic 2009 is in a tall office building at 55 M Street, S.E. at the corner of Half Street. It is next to the new National Stadium. The metro opens into the side of the Artomatic building (green line, Navy Yard, Ballpark exit). Artomatic (artomatic.org) is a FREE, 5-week (May 29 to July 5, 2009) multi-media event in D.C.'s Capitol River Front neighborhood. Check the Artomatic 2009 website (artomatic.org) and our website (heritagefilm-videofest.org) for updates on additional screenings. Hope to see you there!